Our ''GM Delco Style'' distributorless ignition coils produce higher energy output, up to 45,000 volts, with lower primary resistance than stock type coils for higher RPM capabilities. The brass terminals are a vast improvement over the stock aluminum terminals in both electrical conductivity and corrosion resistance. Bolts directly to the stock coil locations. 4-cylinder requires 2 coils, 6 cylinder requires 3 coils and 8-cylinder requires 4 coils. Fits 1987-01 GM DIS systems. Will not fit LS1/LS6 engines with individual coil packs. Does JEGS 40122 fit your vehicle? 40122 is rated 4.7 out of 5 by 3. Rated 5 out of 5 by Eric84 from Quality for a good price. The coils give me around 15% more power. Easy install. Very happy with jegs products. Rated 5 out of 5 by The Night Train from Nice coil packs. My GTP was in need. The coil packs delivered. Thanks Jegs. Rated 4 out of 5 by LarryMow from Items as promised and for a fair price I recently bought a 3 pack of ignition coils for my car. The items were shipped very quickly and were just as described. 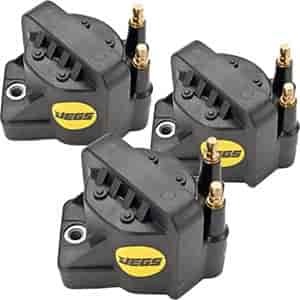 Jegs prices were very competitive with other places online, but their reputation for quality and great customer service is one of my biggest deciding factors. Thanks Jegs for quality product and great prices. where do I find install insturctions? 6 cyninder gmc, hei dist. There&rsquo;s no instructions for this, it&rsquo;s a plug and play replacement.